Pet lovers all around the world agree with the fact that their pets are family. If looking at those furry and cuddly animals makes you feel good inside then probably your browser contains a handsome amount of ‘starred’ pet blogs that you go through every one in a while. But if your bookmarked pages need an overhaul and you need to refresh your reading routine regarding the fluffy and feathery things then below we have compiled a list of 31 pet bloggers that you should follow for pet healthcare, pet imagery and specialized pet needs. Follow Ammo the Dachshund to learn about an extraordinary life that he lives. Ammo plans on making his readers happy and smile. An adventure is awaiting Ammo in every corner. Make sure to read his blog to learn about his most recent encounter with it. If you are always browsing the web for cute pet imagery then you need to look no further than Cute Overload blog. This blog offers its readers a good supply of cute pet pictures to fill their daily visual allowance. Heart like a Dog is a blog run by Jodi. She not only cares about animals but is also passionate about writing. Follow her blog if you are looking for inspiration to start your own pet blog someday. If you’re looking for opinion on pet care and pet training topics then you need to go through THAT Pet BLOG. From ways to exercise your dogs to ordering medications, it covers a lot of topics extensively. Christina, the author of The Lazy Pit Bull aims to bring her readers the best in pet-friendly living. People who prefer to make homemade treats for their pets will find a lot of recipes on this blog. If you consider yourself to be one of those people whose day is made after looking at those beautiful birds then you need to follow the blog, Philly Bird Nerd. It’s amazing how this blog is an ultimate celebration of our love for pets. If you go through this blog you will be able to get some excellent suggestions on where you can spend quality time with your dog. Patricia Sund lives in Florida with her three African Greys. She took courses which she claims “change the way you view your birds” and highly recommends. Michael just loves parrots and he shows that in his amazing Youtube Channel and on his website. That guy is a master at parrot training and he even manages to tame done the most insecure and aggressive parrots. Absolutely amazing guy! Check out his website! Sarah is passionate about animals and she works with a bearded dragon rescue organization. 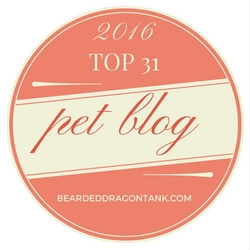 Follow her blog to learn more about bearded dragons. This blog may just be the ultimate celebration of our love for horses. We definitely recommend to check this awesome website out. Stacy, even as a young child loved riding horses. Her aim has always been to be a good communicator with her horse and we are sure she reached that goal and even more. The author of this blog moved to Texas 6 years ago with her husband and now she’s moving forward in life with her herd of animals. Amazing website! We wish her all the best in her life! The Wandering Herpetologist is a blog which is dedicated to providing news, facts, and educational information about amphibians and reptiles. The owners of this blog aim to dispel the misleading myths about reptiles and amphibians and to inspire people to learn about them. Matt Wilson, a herpetologist and the creator of this blog shares information and photography about amphibians and reptiles. This blog is an ultimate source of well-written and original articles to learn new stuff about snakes, and see amazing photography and custom graphics. If you’ve ever browsed for tips on looking after the health of your reptiles then look no further than Reptile Talk. You can get information on how to take care of snakes, lizards and chelonian. Tamar began “I Have Cat” as a way to chronicle her life as a 30-something NYC singleton looking for love despite the complication of owning cat (s). To create a consciously joyful life for your little furry family members, you need to take a look at this blog. The house bunny featured in this blog loves having fun and playing around. Follow this blog to keep up with the daily adventures of Speedy, a male Himalayan Rex. Tango, Siren and Molly, apart from being the members of their local fire department are also mascots for the Keep Kids Fire Safe Foundation. They love helping keep children and their caregiver’s fire safe! Cats and dogs enthusiasts are sure to appreciate this blog for what it stands for. Life with Dogs and Cats has received a fair share of certifications, acknowledgments and awards. For a unique take on travel and adventure, it’s hard to beat this site! It’s written from the perspective of Tarvish, a Hungarian Vizsla. If you have always found it easy for pets to make you laugh then you need to check out the videos which are uploaded on the Catastrophes blog. If you are looking for a blog which understands why you like keeping geckos then don’t look any further! Gecko Time is THE website for Gecko lovers. The Snake Keeper is a great blog which gives you information about snakes from all around the world. An excellent blog on making the most of life with your cats and dogs by helping them and providing them with care! Rebecca has personally trained a variety of animals in both her personal and professional life and she aims to give tips to people who are looking to help out animals. Janea Kelley gratefully and gracefully accepts her status as chief cat slave for her family of feline bloggers. SSAR is a not-for-profit organization established to advance research, conservation, and education concerning amphibians and reptiles. If you are like us, you love all animals on earth. No matter if is a bearded dragon, a cat, a dog, or a horse. Animals are just great an we are happy that there are so many awesome people who blog about their pets and share such amazing storys with us. You should definitely check those awesome bloggers out! The Best Reptile Incubator In 2018 – Happy Breeding! Hey! I am Pierre. I own bearded dragons and many other reptiles for a very long time. I know from experience that it can be very hard to find the right information about a specific reptile, since there is so much misinformation out there.That´s why I created this website. To help other people to have the best time with their reptiles. Thanks so much for the feature! This is a great list of blogs. you deserved it 🙂 Keep up the good work! Wow that’s really cool! Thanks for featuring us! Thank you for your great content! Hey, you have a great list of pet blogs to follow here. I am more into dogs so I immediately followed those that talks about dogs, haha. I love to read stories of them especially if it is about adventure or just some funny moments with them. Thank you for sharing this. Keep it up! Thanks a bunch for the lovely blogs. Bearded Dragon Tank Copyright © 2019.